1981’s Time Travelers Strictly Cash is Spider Robinson’s second Callahan’s Crosstime Saloon collection. Sort of. More on that after the break. Bar stories are a recurring motif in science fiction. See also Tales From the White Hart and the somewhat less classic Tales from Gavagan’s Bar, as well as the Draco Tavern sequence. The conceit is simple: people gather to consume alcohol and share stories or experience events not necessarily inhibited by plausibility. It’s a variation on the club stories genre, which itself is a riff on the general trope of people telling stories to each other in some plausible setting. Decameron (people tell stories in a villa); Canterbury Tales (people tell stories on pilgrimage); people telling stories by the comfy fireside, or on a dark and stormy night, or around a campfire … Authors have come up with a multitude of settings in which people might be telling stories to each other. In the case of the Callahan’s tales, all of the stories are told by habitual barfly Jake. Everyone at the bar has some traumatic backstory which they are trying to blot out by consuming excessive amounts of a toxic depressant in the company of like-minded friends. Jake, for example, invested years killing brain cells and slowing dissolving his liver in his effort to forget how his efforts at car maintenance killed his wife and child. So far, the Callahan cure does not appear to have worked, but hey, it’s drink to excess or take a course in auto mechanics. Anyone is welcome at Callahan’s, from aliens to talking dogs to time travelers1. As is generally the case with bar stories, these are (supposedly) comic. Some of you may remember that I have a barely discernible sense of humour and may therefore wonder if I am the best choice to review this venerable collection. Let’s find out together. Each story or essay is accompanied by commentary from Robinson. Robinson adopts a new conceit for this volume of Callahan’s Crosstime Saloon stories: he grudgingly admits they’re true. He also explains why so much of this book is non-Callahan material: Ace Books editor Jim Baen2 was quite insistent that Robinson deliver his contracted book on time and since Robinson had not published a sufficient number of Callahan books to fill out two volumes, non-Callahan material was used to flesh out the volume to full length. Sometimes working in the publishing industry involves deciding which of several unpalatable options is least unsatisfactory. See also “life.”. The regulars deal with a distraught woman whose increasingly estranged husband is cursed with the ability to see unavoidable disasters. This particular evening, her husband is clearly aware of something awful impending. Her guess as to what it might be is lamentably incorrect. Faced with the revelation that the man who woke from cold sleep is not the husband he was when he was frozen, plutocrat Rebecca Howell decides to reincarnate him. When she’s twenty, I’ll only be fifty-seven, he thought happily. Not even middle-aged. It’s going to work. This time it’s going to work for both of us. He set down the scotch and told the desk to locate him a girl who had been born at one minute and forty-three seconds before noon. After a moment, it displayed data. He took a long drink of scotch on the strength of it, and then he told the desk to begin arranging for the adoption. But it was the courtship he was thinking about. Heinlein-style protagonist or Victorian-era villainous rake eyeing his ward’s estate? It’s so hard to tell them apart! Dinsdale isn’t just creepy. He’s Nice Guy who hangs around a woman with no interest in him for years, then quickly leaps on a chance to manipulate her into a relationship with him creepy. He is also a dab hand at convincing himself that what he wants to be true is true, which is going to make childhood all kinds of fun for that orphan. While I suspect he’s supposed to evoke sympathy, I think a reasonable reader could see this as the story of a terrible, self-centred woman being consigned to a thematically relevant hell. This is interesting for two details. Wait, three. No, four. Perhaps I should take some time out and return when rested. 1) This essay features a small Freff illustration. What are the odds that two consecutive Tears reviews would feature Freff? 2) The reviews display a strain of folksy anti-intellectualism. Fans are slans but god forbid that they should engage in any moments of introspection or analysis. 3) We learn how Robinson got his first reviewing gig for Jim Baen; Galaxy’s owners were disinclined to make with the cash and Robinson’s predecessor got tired of waiting to be paid. Well, I’ve been on both sides of that: rage-quitting over pay and exploiting other people’s exits3. 4) But the most interesting fact about these reviews (at least to me) was that Robinson later disavowed one of them. He decided that his review of the de Camp story was fundamentally wrong-headed. He could have just ignored the issue. Most books are ephemeral. As are magazines. And book reviews. Who remembers book reviews? It’s not like there’s an archive for old magazines. What Robinson did: apologize to de Camp, in person and when the opportunity presented itself, in public. Class act. Pun night at Callahan’s is enlivened by the arrival of a ventriloquist and the mute who serves as his puppet. For various reasons, both the ventriloquist and his assistant have problems fitting into the mood of the moment. The regulars address the issue with aplomb. What sort of monster thinks puns are socially acceptable? Unexpectedly confronted by a dying addict, the protagonist puts his life on hold to save her from herself. On rereading this, I realized that I don’t understand the economics of wireheading. Surgery to allow stimulation of the pleasure centre cannot be cheap, but only a few would have the cash to finance suicide by incessant self-stimulation. How is it that this market is big enough that brain surgeons will cater to it? Is this online? It seems like the sort of essay that would be online. Ah, here it is. I suspect that a surprisingly high fraction of post-1980 hyperbolic defences of Robert Heinlein and his works trace their lineage back to this specific essay. It does contain a line that made me laugh out loud. I do not worship Robert Heinlein. A would-be con man seeking to bilk the regulars fails to appreciate that Callahan’s attracts all sorts. What possible purpose underlies the minor wizard’s futile attack (using a device that cannot possibly affect its target) on the greatest wizard the world has ever seen? It may be that the Big Bad’s perception is global, but the story seems to suggest the apparatus is physically close to the Big Bad. There doesn’t seem to be any reason the minor wizard would do their spell where the Big Bad could see them, except to give the Big Bad the chance to sneer at what’s clearly an ineffective attack. A speech Robinson gave at an early Minicon. A fair chunk of it is fan toadying. Do assurances that they are better than non-fans fill some gaping void in fan souls? Asking for a friend. No, this is not some weird artefact of past fandom. I recently read a Facebook essay on the subject: “Campbell was totes right about sf fans like me being way awesomer than everyone else.” Writer did not stop to consider that this encomium was proclaimed by the same guy who thought the Dean Machine and Dianetics were the bees knees. This is another story whose typesetting defeated modern ebooks. The bad guy’s first step to eeeeevvvvvvviiiiiilllll seems to have been a minor lapse of memory. I find that mildly disturbing, given that I am the sort of guy who has a system to ensure he won’t forget to put on pants before he heads off to work. In a world where minority rights have gone wild, even children can divorce their parents. The upside is there’s now what amounts to speed-dating for prospective parents looking for replacement kids. I do not for one second buy that the kid in this story is a kid. He’s less convincing than an Orson Scott Card kid. Robinson then segues into an admission that, as a new parent himself, he finds himself wrestling with questions regarding how to be a good father for which he has no quick, easy answers. As it turned out, Robinson was handed some drastic parenting challenges. Many of these stories did not work for me and I think I know why. Robinson spends a lot of words telling us how funny the characters find their own japes. This amounts to a laugh track, which is tantamount to admitting that the stories cannot stand on their own. Laboriously explaining the joke is an accepted fannish tradition, of course. To heck with tradition. I reread this book mostly to remind myself of Robinson’s de Camp review and subsequent events. I am all too well aware that, given enough time, every reviewer steps on a rake or two. I find it instructive to see how other professionals deal with screwing up in public. The temptation to simply let the review fall into the memory hole4 cannot be small. I am impressed that Robinson took the least comfortable option and apologized in public. 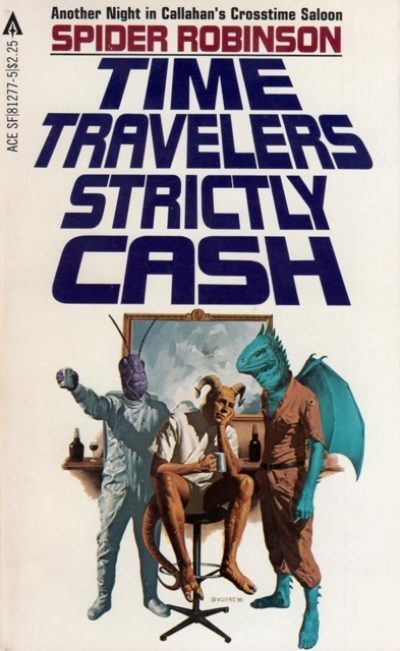 Time Travelers Strictly Cash is available here (Amazon). If it is available from Chapters-Indigo, that fact is a well-kept secret. 1: I believe a later volume revealed a “no fat chicks” rule but that was late in the series. 2: A quick timeline of the Robinson-relevant section of Jim Baen’s career: From 1974 to 1977, he was editor of Galaxy Magazine. From 1977 to 1980, he headed Ace’s Science Fiction line. From about 1980 to 1983, he worked for Tor. In 1983, he founded Baen Books, where he remained until he died in 2006. 3: Canadian reviewers have a huge competitive advantage because we have single-payer health care up here. None of us is distracted by having to choose between paying rent or getting treatment for a heart attack. American inhumanity to other Americans creates vacancies into which I have stepped. On the bright side, I will never have to eliminate my US competition. The Republicans will always be willing to do that for me. 4: Or, as Asimov’s did with a particularly egregious Norman Spinrad piece, go full Nicolai Yezhov and replace it with an innocuous essay with no indication that such a swap occurred. Pity for them that the Internet Archive exists..
Rah, Rah, R.A.H. !--I had either not read this, or successful expunged it from my memory. That is one weird essay. Not "weird" in an "interesting ideas" sense, but in the sense of a particularly odd train wreck.